Harley carburetor jetting should only be performed after completing the fine tuning procedure described under Performance Tuning and your Harley is still running too lean. A good rule of thumb is to replace the Pilot Jet first and only replace the Main Jet once the engine’s idle and midrange are satisfactorily tuned. The Main Jet is only used at 3/4 to full throttle and has no effect on the idle or midrange mixture. Main jet replacement should be reserved until after the slow idle jet is replaced and mixture is tuned unless a lean condition is apparent during full throttle. 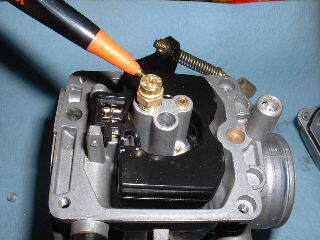 Harley carburetor jetting can be accomplished with minimal mechanical knowledge. With a flat head screwdriver unscrew the Main Jet from the brass needle jet holder (aka Emulsion Tube).Note the jet size stamped into the top of the jet (i.e. 165). There is no need to remove the emulsion tube unless required for cleaning. I don’t recommend “Power Tubes” as they change the mixture and ability to tune with stock jets. Replace the Pilot Jet with one size larger. This of course assumes that you are starting out with the stock jet size. Harley Davidson Pilot Jets for CV Carburetors are normally sold in sizes 40, 42, 45, 48, 50, and higher. 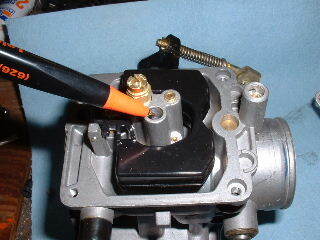 A Stage 1 Carb Kit will normally offer you a proper range of jets for your particular model. If your stock jet was a #42 the next size larger will be #44 or #45. Only increase the jet sizing one size at a time to avoid an overly rich idle. An EZ-Just mixture screw will also assist in fine tuning once you have the correct jetting. Only replace the Main Jet with one size larger after properly tuning your slow/idle jet settings. Main Jets are sized incrementally by 5, so if your stock jet was a #175 the next size larger will be #180. you should only increase the jet sizing one size at a time. Avoid installing jets that are too rich as this will create a sluggish feeling at full throttle as well as contribute to plug fouling. Many Twin Cam models (except California) are already appropriately jetted with a main jet that will allow for a good starting point for tuning. As mentioned, proper mixture adjustment is key to proper jetting and should be performed first.Reinstall the bowl making sure to align the accelerator pump shaft and rubber boot. Install the carburetor back onto the bike and perform the tuning procedure as described under Carburetor Tuning. As you can see, Harley carburetor jetting is a fairly simple procedure that under most conditions will yield greater performance when requiring a richer fuel mixture.